Serious concerns have been raised about the system for responding to civil emergencies in Wales. Emergency services were praised for their response but doubts have been raised by the Wales Audit Office (WAO) about overall co-ordination. Examples of emergencies in 2011 included the Gleision mining disaster and the Chevron refinery explosion. The WAO warns few plans drawn up by police, fire services, health bodies and councils meet minimum standards. The watchdog has warned that lines of responsibility for those responding to serious incidents are unclear. It added there was a lack of training to support and test them. 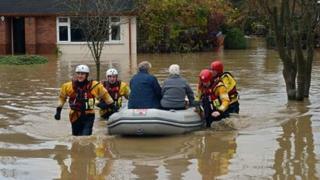 The Welsh government said it continually reviews its procedures for dealing with emergencies. The serious flooding in Denbighshire and Conwy last week prompted emergency services, councils and rescue teams to work together to evacuate people from their homes. Responsibility for emergency planning falls on both Welsh government and UK Government for different parts of the work. The Wales Audit Office says this makes the job of co-ordination much more complicated and it can lead to confusion about the roles and responsibility of the different planning groups and risks potential gaps or overlaps. The report praises the Welsh government's "effective and skilful" responses to many of these major incidents like the grounding of the cargo ship in Colwyn Bay and the huge tyre fire in Swansea in June last year. But there are questions about the Welsh government's role because the Civil Contingencies Act 2004 does not actually empower it to do this. The WAO has also looked at plans from category 1 responders such as police, health boards and councils. It says very few of them actually meet minimum standards and in particular are weak in laying out what the role should be, during an emergency, of elected members, coroners and the voluntary sector. In many cases those plans aren't tested through exercises and training. There were also a series of civil emergencies last year - the Gleision mining disaster in the Swansea Valley, during which four miners died, an explosion at the Chevron Oil Refinery in Pembroke which killed four people and a fire in the Brynglas Tunnels on the M4 near Newport. The WAO report praises the Welsh government for its role but warns that there is also confusion about the division of responsibility between it and the UK government. It added that approaches to risk management are inconsistent, and scrutiny and performance management is ineffective. "At a time of constraints on public finance the strength and robustness of the arrangements are even more important," said Alan Morris, group director with the Wales Audit Office. "Having good plans in place, testing these plans, ensuring they are applied effectively is all the more crucial and we think there are weakness in these arrangements," he said. The Welsh Conservatives have now called for a full review of Welsh government civil emergency arrangements. Conservative finance spokesman Paul Davies AM said the "very grave warnings" should be "heeded at all costs". "When emergencies sadly occur, we all rightly expect the correct procedures to be in place and public money to be spent efficiently," he said. "Despite the never-ending hard work and determination of rescue workers - seen most recently in north Wales - it's clear that the current arrangements need urgent improvement." The Welsh government said it welcomed the fact that the report concluded that its civil emergency arrangements "work well". "We will of course consider the WAO report in detail as part of our work to continually review our processes in dealing with emergency incidents," a spokesman added. "We have strong, tried and tested procedures in place for responding to emergency situations and work closely with a range of organisations across Wales, and the UK, where required." Meanwhile the Welsh Local Government Association (WLGA), which represents local councils, claimed the report was based on "out of date and in some cases inaccurate information, and so fails to give an accurate reflection of the current situation". Vale of Glamorgan council leader Neil Moore, who speaks for the WLGA on regulatory and frontline services, said: "Wide-scale improvements have taken place in recent years, and many lessons have been learned not only from challenging and tragic events such as the Gleision mine disaster and St Asaph flooding, but also from Wales' growing experience in hosting large scale events such as the Olympic Torch relay and countless other international sporting events. "Such events have helped develop an excellent multi-agency approach in Wales based on clear plans, procedures and operational orders that are designed to mitigate the worst effects of civil emergencies."